When doing a chart comparison to find out if a couple is a good match, astrologers most often restrict their analysis to solely looking at the inter-aspects and the planets-in-houses overlays. In the past, we already discussed the importance and vital role of a midpoint analysis (that overpowers the inter-aspect analysis) that should never be neglected in synastry. This time we want to discuss another technique in synastry that is as vital and powerful as a midpoint analysis. Every person has a weak spot or a 'weak' area you can find in the horoscope wheel. However, if they have the same 'auspicious spot or area', things may go exceptionally well. There are different methods to find out what these weak (and auspicious) spots or areas are but one technique is just so simple that even lay(wo)men without any prior knowledge of astrology will be able to find things out. It has everything to do with the 30° dial or list that shows the numerical degree of all planets and points in a chart wheel (from 0° till 29°). So, irrespective of the zodiac sign a planet, body or point resides in, what counts is the numerical degree of the planet, body or point. When in a natal chart two or more planets, bodies or points are at the same numerical degree in a sign, they build a configuration that is so powerful that it overrules any other aspect and is part of the astrological DNA of the native. This specific degree becomes a focal point that blends the meaning of all the planets, bodies and points involved. When you date or meet someone else who has the same numerical degree activated because (s)he too has two or more planets, bodies or points at the same numerical degree in a sign, things may become highly interesting (for good or ill). This numerical degree will be(come) a highly sensitive point that will mark and influence the relationship and the lives of both partners involved profoundly (for good or ill). This will become very noticeable when one or more transiting or progressed planets or bodies happen to traverse the same numerical degree(s). Indeed, this focal point will be triggered when transiting or progressed planets or bodies are at the same numerical degree in a sign, and especially when more than one planet is at this degree and/or when a slow-moving generational planet is posited or transiting at this very degree. If all the planets, bodies or points involved in both natal charts are friendly, 'benefic' and/or 'enjoyable' ones and the transiting or progressed planets too are 'benefic', you can expect some highly auspicious experiences or events popping up. However, if all the planets, bodies or points involved in both natal charts are rather inimical or 'malefic' ones and the transiting or progressed planets too are 'malefic', you better fasten your seat belts because an uncomfortable, stressful and/or upsetting situation is likely to await you (AND the relationship alike). That's exactly what happened between Angelina Jolie and Brad Pitt in September 2016. Let's take a look at their case to make it all clear. Take a look first at the 30° dial or list of Angelina Jolie natal chart (see the table left). You will notice that in her horoscope natal Mars and Neptune are all at 10° in a sign. Both planets combined together are not that favorable because they create confusion, inactivity, infections or allergies, dissatisfaction etc. Now take a look at the 30° dial or list of Brad Pitt's natal chart (see the table right). 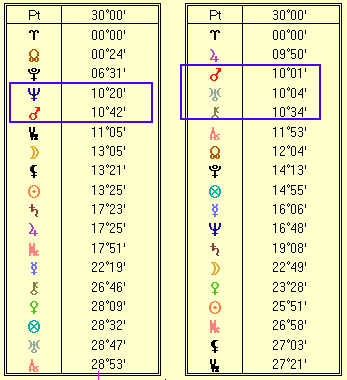 You will notice that natal Mars and Uranus (together with Chiron) too are all at 10° in a sign. Both planets combined together are not that favorable because they are accident-prone, turbulent, disruptive, too independent and may indicate physical injuries, etc. When two people meet who have at least two planets each at the same numerical degree in a sign (in this case 10°), the bond, union or relationship too will be marked by the combination of the principles indicated by all the planets that are at the same numerical degree. All the planets and bodies involved will be triggered when one or more transiting or progressed planets hit the same numerical degree in a sign (10°). This is what happened in September 2016 when transiting Neptune was at 10° Pisces (from August 20 till September 27) AND transiting Saturn was at 10° Sagittarius (from August 30 till September 22). Moreover, transiting Mars too was at 10° in a sign (Sagittarius: between August 24-27) adding to the turbulent configuration. All the (natal and transiting) planets involved (Mars, Saturn, Uranus, Neptune) are not the "nice ones" so that you cannot but expect a turbulent, disruptive period for the partners involved. Indeed, August and September seemed to be rocky for the couple and it does not wonder that Angelina Jolie filed for divorce on September 15, 2016. Hopefully, you see why this simple technique, using the 30° dial/list, is so vital. You are able to see at a glance a weak spot between both partners (but also a fortunate spot in case benefic planets/bodies are at the same numerical degree and all the natal planets involved are benefic too!). If you consider dating someone who has difficult planets at the same numerical degree as you and in case you are not emotionally entangled already, you may better re-consider. Most often, it might be your free will to continue with such a relationship or not (but not always!) and in case you do continue, know that some hardship, stress, disruptions, etc. will be part of your journey with each other with some hard shared lessons to be learned or nasty shared experiences to be lived. Taking the relationship a step further (like marrying) would not be recommended because marriages increase 'emotional intensity' and may add to the hardship. After all, planet Earth is still a learning school where lessons of all kind have to be learned and experiences to be lived for your own evolution and development. To delineate all the possible planetary combinations, we recommend using Ebertin's "Combination of Stellar Influences" (COSI) and blend all the planetary principles in trios together so that you get an overall picture of the combined planetary meanings. This masterpiece by Ebertin is still the most reliable way to find out how the combinations might work out and manifest in reality.